For more information about this event, please contact MXP Productions at info@mxp.co.id. Ticket price is not incl. 15% Tax and service charges (3%+10.000). 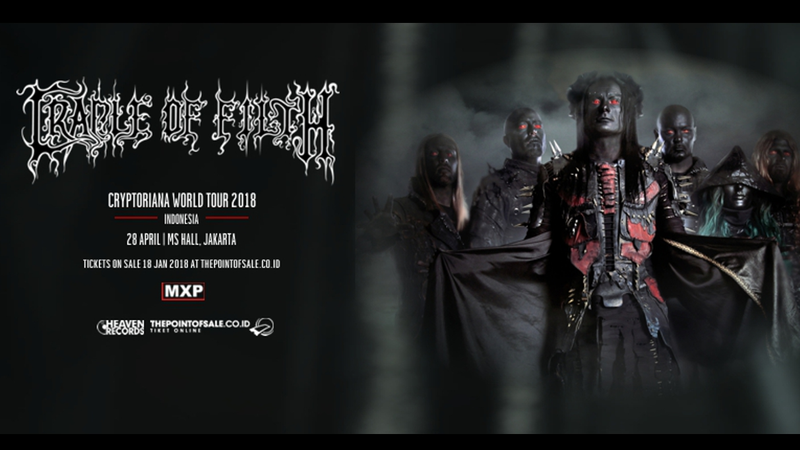 This will be the first headlining show for Cradle of Filth in South-east Asia and held exclusively in Indonesia. Cryptoriana – The Seductiveness of Decay is the new album by this British extreme metal band. It was released on 22 September 2017 through Nuclear Blast Records. Following this twelfth studio album, the band will have extensive run of world tour includes US, Canada, Asia and Australia. Tickets will be sold starts on 18th Jan 2018, exclusively by Thepointofsale.co.id , one of the biggest ticketing company chain in Canada and Asia. Thepointofsale.co.id accepts payment: Credit Card, Transfer Bank (only at ATM prima & ATM Bersama), Bank Mandiri Bill. Cradle of Filth are an English extreme metal band, formed in Suffolk, England in 1991. The band's musical style evolved originally from black metal to a cleaner and more "produced" amalgam of gothic metal, symphonic metal and other metal genres. Their lyrical themes and imagery are heavily influenced by Gothic literature, poetry, mythologyand horror films.